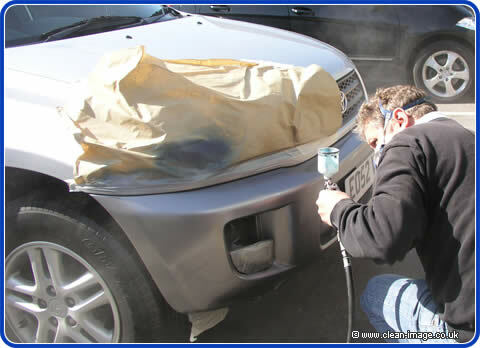 While writing the Paint Sealant Mammoth FAQ and How good is Supagard PrtII, an old customer brought there car into us for a smart repair on a scuffed bumper. It turns out that this car is another vehicle which is an amazing example of how well Supagard works. This is a car that we supagarded from new 6 years ago, and although supagard is only guaranteed for 3 years, it is still working all these years later. How things have changed! 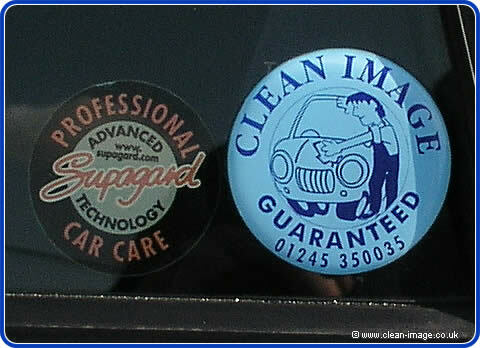 Yes, that is the old Clean Image logo alongside a now very faded Supagard window sticker. (Shortly afterwards, Clean Image got a new logo, and more recently a new name to better suit what we do, which is make cars like 'new again', and keep them that way.). Unlike the other paint sealed cars in this series of articles, we can't claim that over the years it 'hasn't been waxed or polished'. In the words of the owner, "I try to get it in for a valet once a year", and although they haven't always managed, this maintenance regime has helped them keep on top of things, certainly helped keep the car in great condition. The car is very low mileage meaning it hasn't had as much punishment as most, but it hasn't ever been garaged. Being parked outside, it has been at the mercy of the elements all-year-round. During it's 6 year life it has been valeted 4-5 times, and waxed on each occasion. 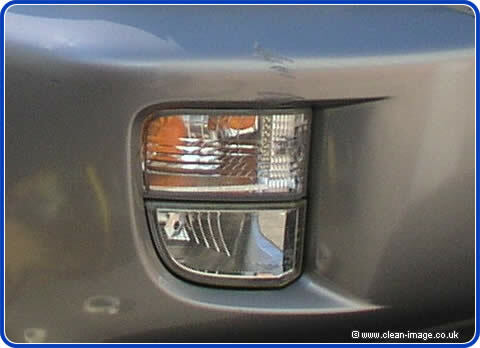 There is a scuff on the bumper that the customer wished repaired. 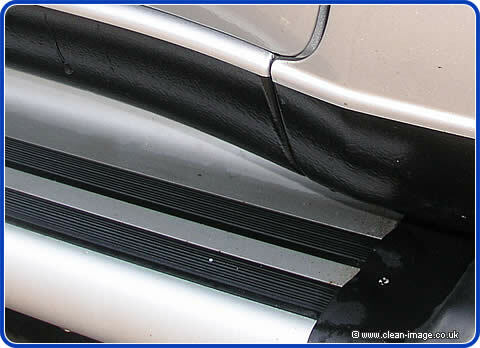 It's best to get this kind of damage seen to promptly in order to keep on-top of the condition of your car. Once this scuff has been repaired we will take a very, very close look at the vehicle. Although we have the facilities to spray inside, Jeff prefers to work outside in natural daylight. Due to European legislation, we have had to change over to water based paints, and there are a few teething problems -- such as with the documentation. There are three possible variation in this paint colour, but luckily Jeff picked the right one first time otherwise it would have been trial and error. 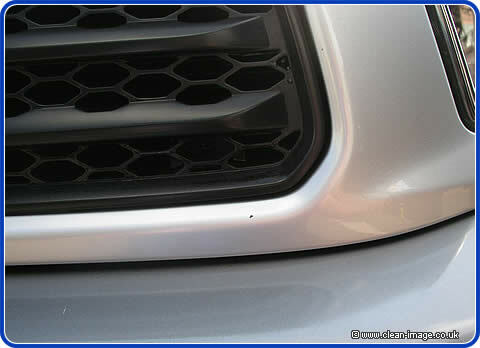 Once the Small Area Respray was done, the car was given a quick wash, (it had been valeted and waxed 2 weeks previously). "Our Raz4 was Superguarded in 2002 from new by Clean Image. Their service was first class and showed in their attention to detail. 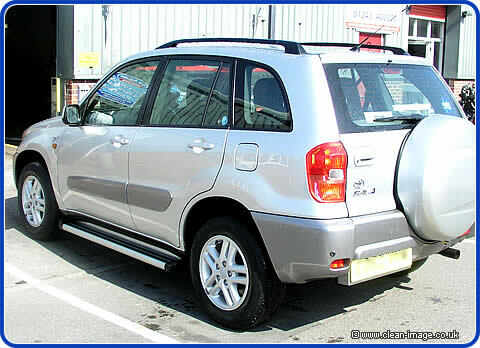 The car was easy to clean and Clean Image leaves it looking in showroom condition after every valet." Although it is a little hard to see, the anodised aluminium strip is slightly stained and tarnished. This wouldn't have been treated with Supagard, although, these days it could be treated with a metal protector like InnoX. This is one of the very few areas of the car that shows age. 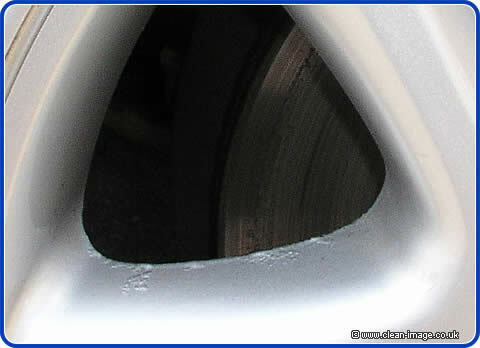 Although bright and clean, there are some corroded areas on the wheels. These days, wheel sealants are available such as Supagard's SupaWheels which can help prevent corrosion, although in fairness, it looks like this corrosion has come through from the backs of the wheels. These areas don't get cleaned unless you take the wheels off to do it -- and who would do that? So this kind of corrosion is pretty much par for the course on a car this age. In total, there are about a dozen small stone chips on the front of the car. This car has very low mileage but this is still very few. Although none of the sealant companies claim that their products defend against stone chips, we have noticed that treated cars always have fewer than normal. 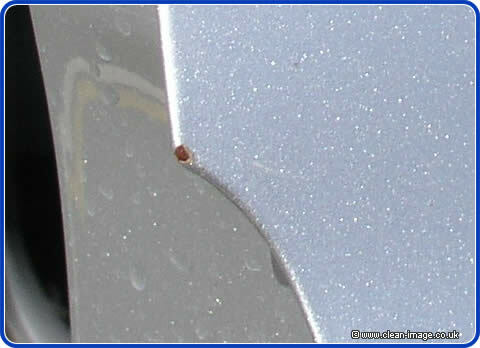 We believe this is because a sealant makes the paintwork less brittle, so most stones bounce off leaving minimal damage. We found just one chip on a door edge. You can see by the wear on the rubber mats that this car gets plenty of use. Yet the upholstery is immaculate. 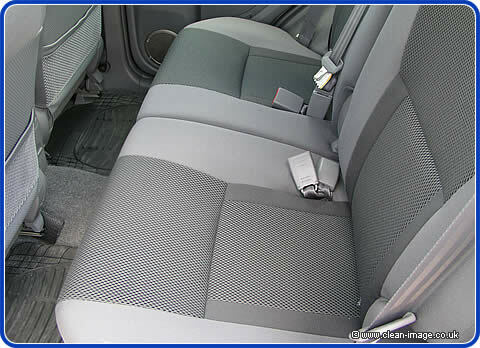 Fabric protection prevents permanent stains on your seats, the interior of this car really does look like new. A rare photo of the web-stig, feeling the paintwork. The upper surfaces are slightly rough. This will be because the car is not garaged and left out in the rain. There will be all sorts of contamination from lime scale to tree-sap, all easily removed with a clay-bar. The upright surfaces are smooth and glossy like new. This customer has no intention of selling the car any time soon, and who can blame them, the car is still new even after 6 years. All with the minimum of maintenance. 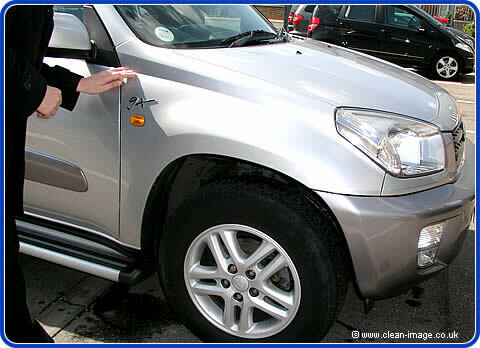 Every now and again it helps to take it to be valeted so that they can use powerful pressure washers to remove dirt which has accumulated in hard to reach areas, and shampoo the seats and carpet. The last valet carried out by us was just a basic Bronze Valet (which doesn't include shampoo or steam cleaning) with our Platinum Long Life Wax -- It needs little else. If you were looking through AutoTrader to buy one of these, this would be the one you would want, therefore it would definitely command a higher price. All thanks to a Supagard paint sealant package. Is is worth the money? You be the judge! What the dealerships don't show you, how a 3 year sealant looks after 7 years. Pretty good.